I had a discussion last night with hubby regarding the current length of his socks and the amount of yarn left. When he realized that I wasn’t actually kidding about then turning into knee socks, he told me to forget using up the yarn and just make them the same length as a pair of his other socks. I checked those today, and I was actually able to cast off the neverending socks! They ended! Yay! Pics to follow once my model is home from work. ETA: And now, my hubby in his natural habitat – at his computer. 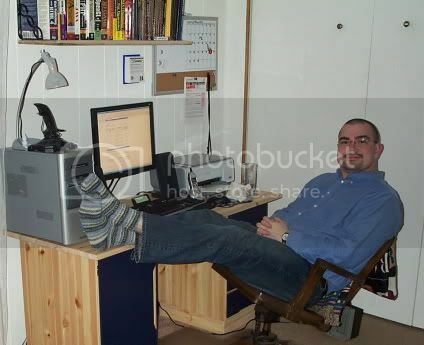 Oh, yes, and his socks. His not knee-high socks, which he has pronounced very comfy and warm. I forgot to post this earlier. As I was watching the Olympics Tuesday night, Rowena joined me. 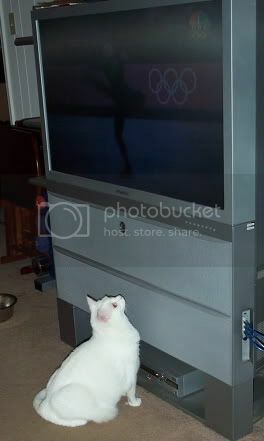 The Ladies’ Short Program was on, and Rowena did something I have never seen her do before – she stood there and watched the tv. She was completely entranced by this one skater (and now I don’t remember who it was – one of the Japanese women, I think). As soon as this skater was done, Rowena lost interest and walked away. Seriously – she has never even glanced at the tv before, and she was just suddenly fascinated by this skater. Silly, silly cat. February 23rd, 2006 | Tags: Beasts, FOs, Knitting | Category: Misc. Oh hooray! I have not tried socks yet, I keep pulling apart my wristlets because I lose track of what stitch I’m on and end up with a moss stitch instead of a rib. Maybe I will put socks a bit farther down on my list of things to knit. I never thought I would get beyond “scarf” and “washcloth”. Awww, I wanted to see a grown man wearing stripey blue knee socks! 😀 Congrats on another FO! Awww Rowena is sooooo pretty. I have yet to finish my first sock LOL but yours look fantastic! Great socks! Glad they are done aren’t you 😉 My hubby asked me tonite…when are you gonna make mine..like, when I first asked him he said no way…well, for home wear…I am still making my KO bag..ughh! !